In our area local business and farm owners often use their buildings to display Christmas symbols such as this one. I am moved by the depiction of Bethlehem’s star and Calvary’s cross. Note: Due to a very busy day an audio version podcast will not be prepared for this message. “Now after Jesus was born in Bethlehem of Judea in the days of Herod the king, magi from the east arrived in Jerusalem, saying, ‘Where is He who has been born King of the Jews? 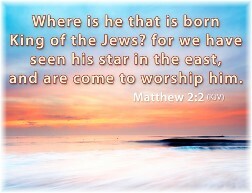 For we saw His star in the east and have come to worship Him'” (Matthew 2:1,2). “After hearing the king, they went their way; and the star, which they had seen in the east, went on before them until it came and stood over the place where the Child was. When they saw the star, they rejoiced exceedingly with great joy” (Matthew 2:9,10). 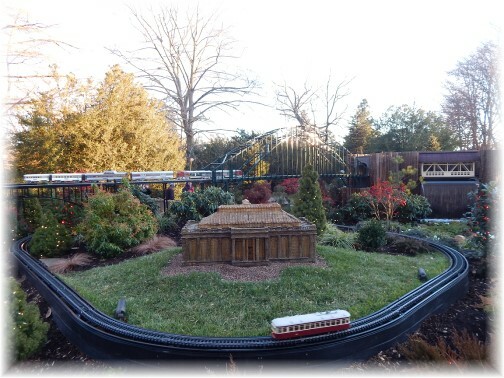 Last Friday we visited a Longwood Christmas at Longwood Gardens. We purposefully arrived in midafternoon so we could see the displays in daylight then walk through the brilliantly lighted grounds at night. A highlight was the lighted fountain show accompanied by Christmas music, including traditional hymns. The lighted displays included one of the Scripturally-based symbols of Christmas, the star. Today let us consider this “star of wonder”. Contrary to traditional Christmas pageantry and artist’s portrayals of the nativity setting, Scripture indicates that although the shepherds were present at the birth of Christ in Bethlehem’s stable, the wise men were not. 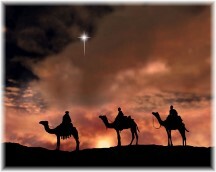 Careful consideration of Scripture actually reveals that the magi (traditionally wise men) from the east who followed the star arrived some time after Christ’s birth. They had first seen the star while in the east and had traveled to Jerusalem to inquire regarding the exact place of Christ’s birth. Just who these magi were remains a mystery. Possibly they were among those from the Jewish line who stayed in the East (present day Iran) following the Exile or perhaps they were proselytes who were very familiar with the Messianic promise. After seeing “His star” and receiving the information that Christ was to be born in Bethlehem they went there with a specific purpose – to worship the Christ Child. I believe we have here an example of how God reveals Himself to the earnest seeker. They had seen His star while in the East and then went to Jerusalem by faith. The reappearance of the star on their way to Bethlehem gave them an assurance that their seeking was not in vain! At times the light of God’s guidance is remarkably clear like His star that was initially seen by the wise men while in the east. At other times God’s leading is less clear, such as when the guiding star was no longer visible. But like these wise men, as earnest seekers we walk by faith and obedience to God’s Word. Then we see again the clear, unmistakable light of God’s guidance as the wise men did when they saw the star a second time. Truly this is a time of great rejoicing. Where are you today in your walk of faith? For some the answer will surely be, “I haven’t seen the ‘star’ for a long time”. Keep seeking, believing, and following. Remember this important truth: “Without faith it is impossible to please God, because anyone who comes to Him must believe that He exists and that He rewards those who earnestly seek Him” (Hebrews 11:6). Let us call on the Lord to “Guide us to Thy perfect light.” and may we all see the star of wonder! Daily prayer: Father, Your Word is a lamp unto my feet and a light unto my path. Help me to journey in faith when the path is dimmed or obscured from that which You have planned for me. When I can only see through a glass darkly, help me to trust You for what is yet to come. May I have a believing, obedient spirit even when I don’t fully understand Your plan. For Your thoughts are not my thoughts nor are Your ways my ways. They are higher and wiser, for they are of divine origin, so help me to be mindful that You always know what’s best and will lead me according to Your will and Your timing. Amen. 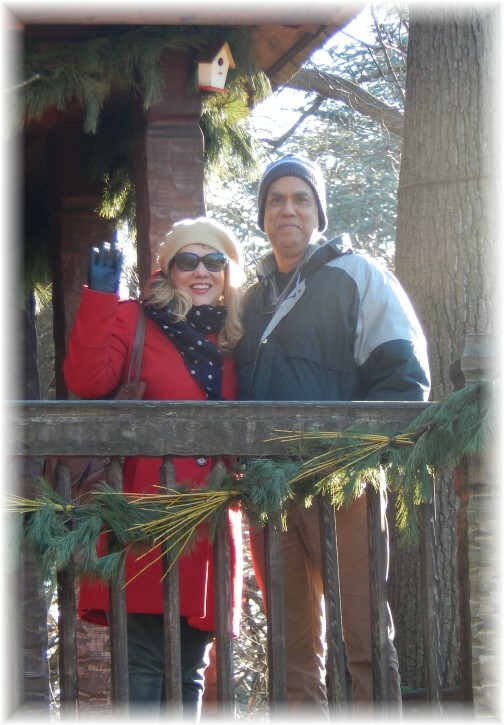 Special Note: We want to thank all who have financially supported our ministry this past year. We typically see a spike in giving at the end of the year for which we are most thankful. We realize there are many fine ministries and causes requesting support at this time but if the Lord would lead you we surely need and appreciate the financial support from our readers and listeners. Our ministry (and support) is essentially comprised of half our time to Daily Encouragement and the other half to our chaplaincy ministry to companies (of course, this varies week by week). Each of these ministries essentially is the same as a part-time job for each of us (20+ hours weekly). Our goal for many years is that each phase would provide half of our ministry expenses and family income. You can donate by check, online or using PayPal. If you would like to make a donation see here for more information or donate directly online here. Thank you! Note: We thank those who have contributed the last several weeks. Due to a very busy schedule we are behind in our thank you’s and acknowledgments. 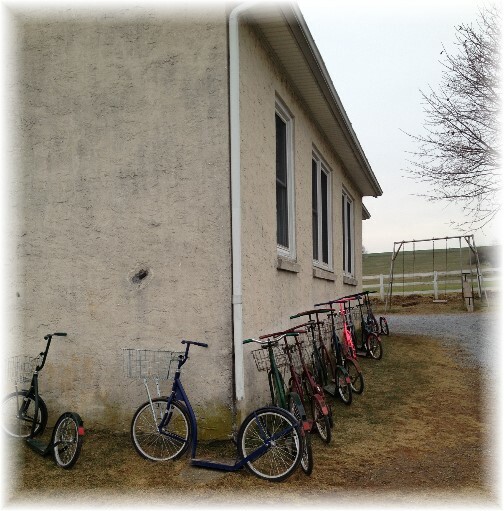 Yesterday afternoon we attended an Amish children’s Christmas program in a one room schoolhouse way out in the country. We didn’t take any photos inside the packed schoolhouse out of respect for Amish ways but it was very interesting and the kids did an outstanding job under the direction of their 18 year old teacher. She has excellent control of some 25 children from 1st to 8th grade. The program began with the children singing “How Deep The Father’s Love for Me” in German! We were invited to the program by our Amish friends Jesse and Anna Ruth, who have four children in the school. Afterwards little Eli James asked me, “We’re we expressive?” something his teacher must have really emphasized and they sure were. Personal note: Last night we received a call from a man we visit in the course of our chaplain ministry. He had shared during our visits about a troubled son he was praying for. Last night he called to inform us that yesterday this son was a shooting victim and is in the hospital with critical injuries. We will stop by the hospital this morning to seek to see him. 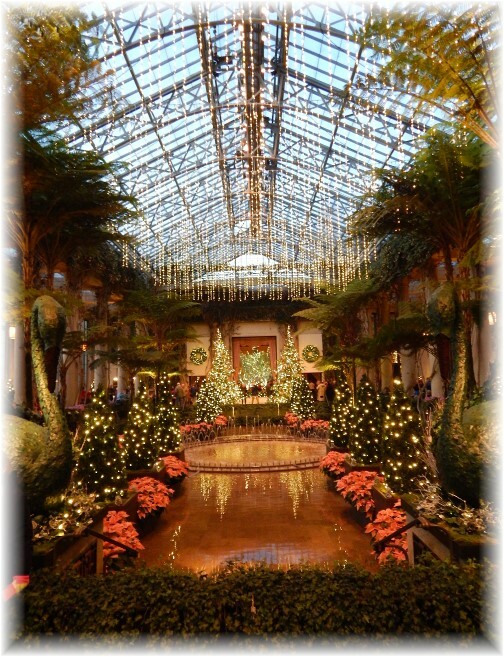 Last Friday afternoon we took Stephen’s sister and her husband to visit “A Longwood Christmas” at Longwood Gardens, which is about an hour from us. 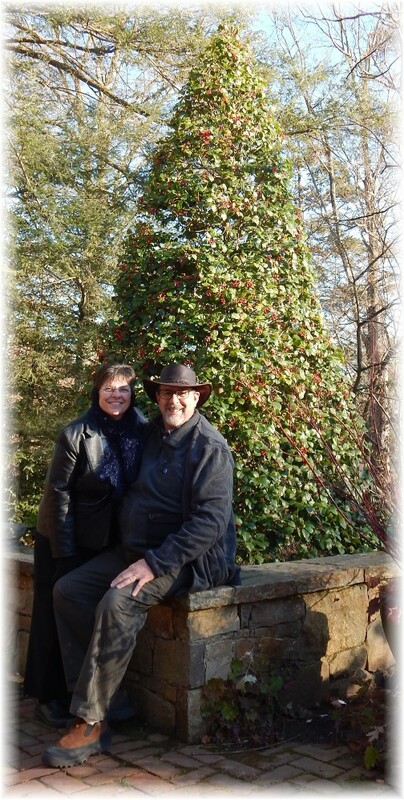 Here’s a photo of us at the Longwood Gardens this last Friday afternoon. 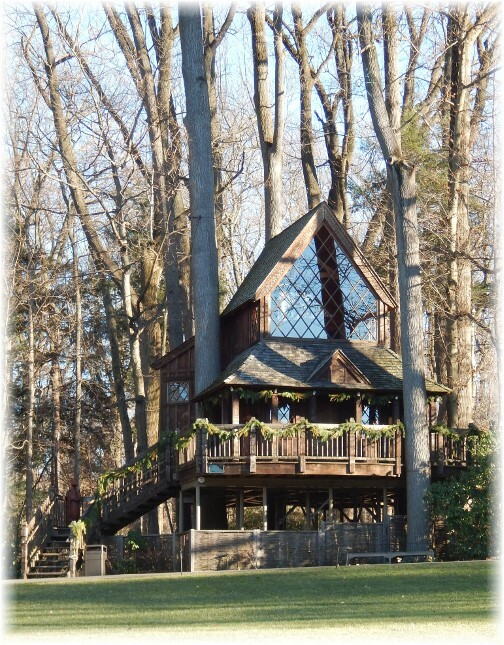 They had several large treehouses on the grounds. Stephen’s sister Genelle and her husband Cesar up in the treehouse. 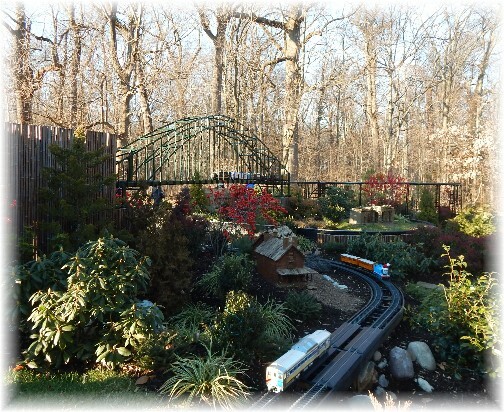 Of course Stephen liked the huge model train display. Walking through the interior conservatory we had many scenes like this. Each year we share several online resources that we have used over the years and that may be a blessing to families and churches during this Christmas season. “In Remembrance of Me” pdf This is a passion-filled Scripture reading for two adults. We have used this reading with great receptivity during Christmas Eve services over the years. We suggest, if possible, a musical background as the message is read. It is also a great lead-in to a Communion service. It should be thoroughly practiced and read with great feeling. “When Christ Was Born” pdf This is an adaptation to the tune of “How Great Thou Art”. It’s a great song to sing as a congregation since most are familiar with and love the tune. My First Christmas In Heaven This is a blessed reminder for all who lost a loved one this year. This is the poem that Brooksyne read and wrote about in this message. We have also posted two Christmas carol quizzes here (scroll down). Are you Christmas shopping online? Daily Encouragement Net is an affiliate of Amazon. Any orders placed to Amazon using this link or any specific product link to a recommended resource in a message will help our Daily Encouragement ministry through a small commission on the sale. Thank you for considering using these links when purchasing online through Amazon! Tip: If you are a regular Amazon customer consider bookmarking this link and using it whenever you shop on Amazon. Looking for a very special Christmas gift for your parents? Looking for a very special Christmas gift for your children?